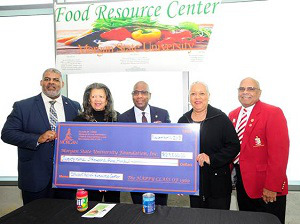 Morgan State University (MSU) students who are hungry or food insecure will have a new hub to receive food resources and education around healthy food-related strategies this December. 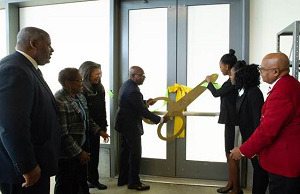 The Food Resource Center announcement and ribbon cutting ceremony at Morgan State. The campus Food Resource Center (FRC) – housed in the Morgan Business Center – opens on Dec. 7, offering students canned soups, vegetables, meats, boxed meals, cereal, snacks and more. The center’s launch comes after university-wide surveys found that 68 percent of MSU students identified as food insecure and 71 percent of students reported skipping meals because of a limited food supply. The Food Resource Center plans to distribute food to students every first Friday of the month between 3 and 6 p.m. during the school year. Students only need their BEARcard student I.D. to access the center. If the center sees a higher demand, the frequency of food distribution will increase, said Dr. Kevin Banks, vice president for student affairs at MSU. Banks noted that FRC organizers consist of five to six student and staff volunteers who came up with the idea for the center after similar Hurricane Harvey and Irma relief efforts last year. “We organized a food drive last year with perishable items. We sent it to [Houston] and the Virgin Islands,” Banks said, noting that students loved the food drive idea. Samone Crews, a junior elementary education major at MSU and member of the FRC committee, was one such student who raised the issue on campus after seeing first-hand the toll food insecurity had on friends and classmates. While running for sophomore class senator last year, she proposed an idea for a food pantry and provided Student Government Association (SGA) leaders with research on institutions with food pantries who had similar demographics to MSU. Her proposal passed and SGA leaders brought food insecurity amongst students to the attention of administrators. SGA and the Division of Student Affairs worked to assess how prevalent food insecurity was on campus through surveys; 96 percent of faculty, staff and student respondents indicated a student need for additional food resources. The Earl G. Graves School of Business and Management stepped up to host the location for what would become the Food Resource Center, Banks said. FRC organizers now have a goal to collect 100 bags of nonperishable food items from each of MSU’s schools and colleges. But beyond distributing food, organizers hope that students will use the center as a tool and resource for educating themselves on food options and healthy living in general, Crews said. She does not want students to feel embarrassed or stigmatized about needing additional food support. The Food Resource Center will host educational sessions and workshops on couponing, meal prepping, healthy eating and familiarity with nutritional value, among other topics. A nutritionist on campus will also help with education efforts. “We plan on partnering with her to make sure we’re getting the word out about healthy eating,” Banks said. MSU Class of 1969 donated $29,500 for the Food Resource Center. People have already started reaching out about helping support the center, Banks added. And at the Food Resource Center’s launch announcement, the MSU alumni class of 1969 presented a gift of $29,500. President Wilson personally donated $500. Center volunteers encourage students, faculty, administrators and others in the community to visit the Food Resource Center website and donate food, their time or money. “It doesn’t take a lot of money. It just takes people who care,” Banks said of sustaining the center. Crews said the Food Resource Center will be a continuous project and hopes that it lasts beyond her and the other committee members’ time at MSU. Wilson added that it was “truly magnificent” to see how quickly campus constituents came together to address the issue of food insecurity in a meaningful and tangible way.